Ranjha Ranjha Kardi Episode 4 Story Review – Tonight’s episode of Ranjha Ranjha Kardi was yet another one which had it all, stellar performances from an extremely well-chosen cast, appealing and attractive dialogues, screenplay which does not leave anything to your imagination and superb direction which gives the story the perfect flow. Tonight’s episode also introduced the viewers to some of the other important supporting characters in the play. Sahir’s family continues to be a mystery therefore we can’t be sure if Sahir really is being honest. Bhola and Noori both are in love with people who they don’t have a future with. While Noori dreamed of making it big one day so that she would be more ‘acceptable’ for Sahir’s family, Bhola stole his mother’s gold jewelry to please the only ‘woman’ he loves. With every passing episode, the similarities between these two characters are more obvious than ever. Their love stories are also similar in some ways; Bhola runs away from home to meet Mumtaz Begum and Noori does not want to go home because she cannot stay away from Sahir. Even though Bhola’s mother loves him but he feels like he belongs with Mumtaz Begum, Noori too never felt a sense of belonging towards her family but is willing to do anything to be part of Sahir’s life. Even after trying her best to be different from her family members and continuously looking down upon them because of their lifestyle as well as their profession, Noori cannot change the fact that her family will always be her identity. Sahir keeps you wondering since the viewers have not been introduced to his family just yet and he has never been shown thinking about everything that is happening. This was not the first time that Bhola stole something therefore it seems that Mumtaz Begum is using him. Even after Sahir made it quite clear to Noori that they can never be together, she continued to stay in touch and was just as enthusiastic about this relationship as she was before. Noori is more than confident, she is over-confident and she is convinced that she has everything under control. She is a little lady with big dreams and she believes in herself probably more than she should. Noori does not even let reality checks like the one she got today stand in the way of her dreams. I must say that this was the first episode in which I looked forward to and enjoyed watching Noori’s story just as much as that of Bhola’s. 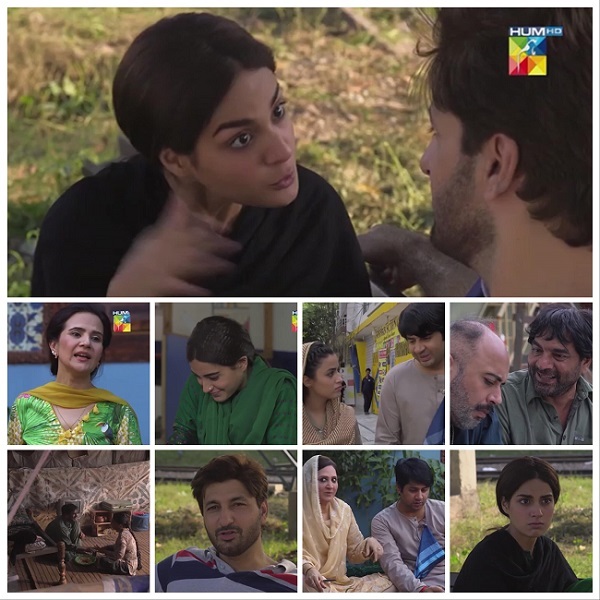 Iqra Aziz’s exceptional performance, her entire look in this episode and the way this character has been etched-out makes Noori an enchanting character. The realities of Noori and Bhola’s lives are completely different from the lives they are continuously trying to live. No matter how much Noori criticizes the things she hates, the fact is that she won’t be able to do much if her parents decide to “sell/marry” her off to Shoka. Similarly, the meetings and conversations with Mumtaz Begum might give Bhola a temporary escape but in the process he unintentionally hurts the only person who really loves him – his mother. The way Bhola’s mother made excuses for him was heart-warming. She protected him while he was away even though she is constantly telling him off when he is with her – this reminded me of his “meeni” comment. Imran Ashraf’s performance leaves you in awe of his brilliance every single time. This role is extremely challenging yet he gives all these expressions and delivers a faultless performance in such an effortless manner. Iqra Aziz continues to be at her best, her performance tonight was especially impressive. Syed Jibran has translated his character so well on screen that every scene he is a part of comes across as natural. The entire supporting cast is well-suited for every character they are playing but my favorite has to be Noor-ul-Hassan! Tonight’s episode was heartfelt, well-paced and engaging. The performances were powerful as well as persuasive. This drama has so much to offer since Noori and Bhola’s stories are deep, meaningful, sensitive and extremely emotional. Although, these two people belong to a world very different from the one we live in yet they have the viewers’ undivided attention because their stories are so easy to connect to. Their naivety, frustrations, complexes and dreams have all been executed brilliantly on screen. Loved this episode and waiting impatiently for more. Watching this drama is like reading a beautiful book, you want to pause and absorb every single dialogue and moment so yes, I will be watching this episode one more time too.